Origin: Arid highlands of central South America in he countries of Brazil, Uruguay, Paraguay and Bolivia. Landscape Use: Excellent group of bromelaid plants that are best used for up close displays on patios and front entryways as eiher a container plant or rocky display gardens, botanical collections, indoor house window plant. Form & Character: Small, clumping, rossetting, refined, delicate, subtle yet dangerous! Growth Habit: Densely branched, clumping from 3 to 24 inches tall with equal to greater spread. Foliage/texture: Leaves generally elongated, narrow strap shaped fibrous and rigid ranging from 2 to 12 inches long. Margins of leaves often armed with sharp, pointed, hooked white or yellow spines. Leaves often colorful with hues of color ranging from yellow, silver to deep red or maroon; medium coarse texture. Flowers & fruits: Small, tubular flowers on an elongated and coloful stalk to 3 feet long, warm colors ranging from white, pink, salmon orange to red; fruit inconspicuous. Seasonal color: Texturally exquisite and colorful foliage all year and subtle flower colors in spring. Temperature: Tolerant of heat, generally freeze intolerant though some species can tolerate low temperatures down to 15oF. Light: Partial sun in Phoenix. Eastern morning sun best. Avoid western exposures with reflected light. Soil: Use a very porous, coarse well-drained substrate containing small coarse gravel and pumice if growing in a container, otherwise if in soil heavily amend with pumice and sand. Avoid organic matter soil and/or substrate amendments. Watering: Water infrequently allowing substrate or soil to dry inbetween waterings. Pruning: None except to remove spent flower stalks in mid-summer. Propagation: Division of offsets in a clump. Disease and pests: Root rot if soil or substrate is not well drained and allowed to dry inbetween waterings. Additional comments: Dykias are a wonderful group of odd and interesting plants that are great in containers and/or display gardens. Because they are bromeliads, dyckias require special care to avoid root rot. There are 158 known species in the genus Dyckia. Dyckia species readily hybridize. 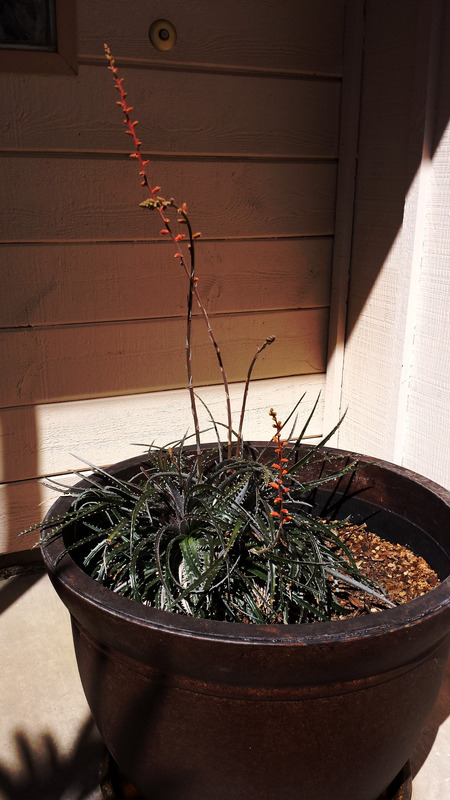 Because of this there are a myriad of dyckia hybrids and name cultivated selections.